1 - 11 $44.80 ea. 12+ $40.50 ea. 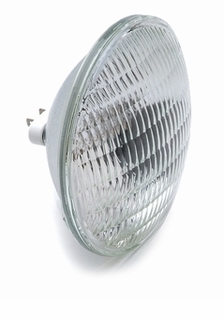 Q6.6A/PAR56/2 200w - Elevated Approach Lamp - Airport Lighting GE38271 - Description: This is a GE38271 airport lighting halogen lamp 6.6 Amper - 200 watt Par 56 with medium flood lens and GX16d mogul end prong connections.. The MOL is 5" and OD is 7". Life is 1000 hours. Nominal light output is 16000 at center.CC-6 filament. CBCP-16000.Burn position both.